Being a part of a household that boasts 4 females, you can guarantee that hair is a topic that comes up quite frequently. While I'm adept at the care and maintenance of hair (which is good thing because between my 3 girls and I there is A LOT of hair to go around), styling is an area that I could use some help in. People have looked to Cozy Friedman for kid-friendly haircuts and styling products since 1994. 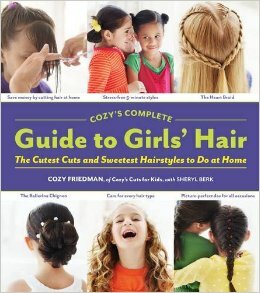 Now after two decades of owning Cozy’s Cuts for Kids, the kid’s hair care authority Cozy Friedman has distilled all of her hair knowledge into one groundbreaking book full of how-to’s, hair helpers and fast fixes for your special girl. Born out of Cozy’s desire to offer girls an outlet for self-expression, Cozy’s Complete Guide to Girls' Hair empowers parents to help their daughters feel confident about who they are and how they look. Unlike hair books of the past, Cozy speaks to every hair type and texture offering all of her best kept secrets. With a handy index, illustrated how-to instructions, and gorgeous photos, Cozy’s Complete Guide to Girl’s Hair makes learning fun and easy. From at-home cuts to painless detangling—Cozy explains it all. There are so many valuable tips in this book that cover the maintenance and care of so many hair types (even African American), and the hairstyles featured are so cute and the step by step instructions make them so easy to achieve (even for me)! Cozy's Complete Guide to Girl's Hair retails for $15.95 and is available at Barnes & Noble stores and on line bookseller sites.